We don’t have much to go off of but this is usually typical of the Slate marketing machine, but it seems Steven Slate is on his way to a complete autonomous recording environment. Next up is the DAW. Also on top of an interface, the Small Diaphragm Virtual Microphone will be released at some point as well. “For twenty years, I have dreamed of bringing the professional studio to anyone who wants to make music. I’m talking about microphone lockers filled with every classic mic imaginable. Tape machines and vintage consoles to add flavor and vibe. And of course, all kinds of outboard processors and effects. However, for as long as I can remember, all of those famous tools have been reserved for the industry elite and people who have lots of money. Well. That’s finally going to change. 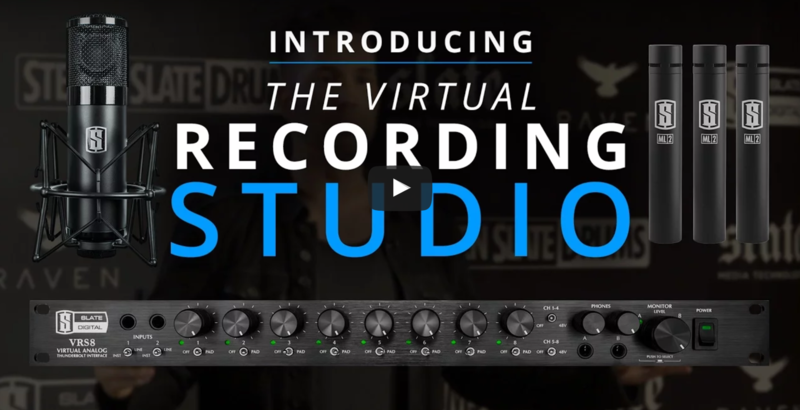 Introducing the Slate ‘Virtual Recording Studio’ featuring the new VRS-8 Interface and new ML-2 Modeling Microphone System. Watch my live keynote address to learn all about it, and see it live at NAMM Booth 6806.